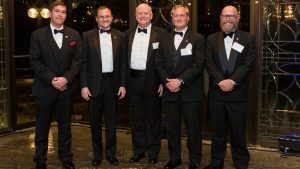 TUSCALOOSA, Ala. — The University of Alabama College of Engineering honored five alumni by inducting them into its 2018 class of Distinguished Engineering Fellows. 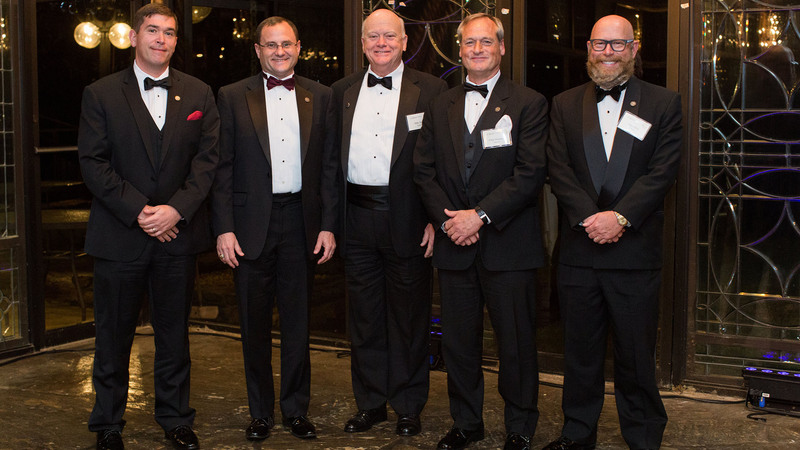 Each year, the College of Engineering inducts a select group of alumni and friends as Distinguished Engineering Fellows. Recognition as a Distinguished Fellow is the highest commendation given to graduates and others who have strengthened the reputation of the College of Engineering through their efforts. Since the recognition’s inception more than 25 years ago, fewer than 400 individuals have been recognized as Distinguished Engineering Fellows. The 2018 class includes John Allen, of Parker, Colorado; Donald “Chip” Flournoy, of Muscle Shoals; Michael Stevenson, of Norcross, Georgia; James “Mike” Tracy, of Vestavia Hills; and Steven Wofford, of Huntsville. The inductees were recently honored at a ceremony at the NorthRiver Yacht Club in Tuscaloosa. For complete biographies of this year’s Distinguished Engineering Fellows, visit eng.ua.edu/awards. After graduating with a bachelor’s degree in electrical engineering from The University of Alabama in 1979, John Allen served as a commissioned officer in the U.S. Air Force as a scientific and technical intelligence officer. He worked at the Foreign Technology Division of Air Force Systems Command and analyzed Soviet radars and avionics to determine any vulnerabilities to electronic warfare. Allen authored more than 30 classified publications, presented papers at international electronics conferences, and briefed his analysis results to the highest levels of the U.S. government. He left active duty in 1983 and continued his military service in the U.S. Air Force Reserve until he retired in 2000 with the rank of major. Allen received a master’s degree in business management from Central Michigan University in 1982. He began working at GeoDynamics Corp. on a project for the North American Aerospace Defense Command where he evaluated the vulnerability of U.S. satellite systems to foreign directed energy weapons and jamming threats. During the mid-1990s, Allen worked for Advanced Systems Engineering Inc. and founded Information Technology Engineering Corp., which he sold in 2015. His interest in high-performance driving and automotive engineering led him to begin car racing in 2013. After 34 years of working at Reynolds Metals Co. and Wise Metals Group, Donald “Chip” Flournoy started his own company, Flournoy Engineering and Consulting, in 2012. The business offers engineering design, project management and consulting services to industrial and commercial clients as well as general contractors. In addition to serving his company, he has also worked as an adjunct professor of engineering technology at the University of West Alabama and Shelton State Community College. He is a licensed professional engineer and a United States Coast Guard licensed captain. He earned his mechanical engineering degree from The University of Alabama in 1978. Flournoy has owned Flournoy Yacht Charters with his wife, Pamela, a 1977 UA communications graduate, since 2004. Both of the Flournoy’s children, Adam and Shannon, are UA engineering graduates. President, Principal and Chief Executive Officer of Engineering Systems Inc.
After only seven years in Tuscaloosa, Michael Stevenson received three metallurgical and materials engineering degrees from The University of Alabama. He earned his bachelor’s in 1998, his master’s in 1999 and his doctorate in 2001. After he graduated, Stevenson co-founded the firm Metals and Materials Engineers in Suwanee, Georgia, and worked there for six years. Since 2007, Stevenson has been at Engineering Systems Inc., or ESi, in Norcross, Georgia. He has held the title of president, principal and CEO of ESi for the past eight years. In this position, Stevenson is responsible for implementing the company’s vision and strategy daily, providing oversight and support for company operations, and harnessing the company’s capabilities to the fullest extent. He is a professional engineer in 11 states, has authored more than 300 technical reports, is a member of several industry and technical societies and has presented at numerous forums. Chief Executive Officer of Drummond Co.
With 44 years of experience in the mining business, Mike Tracy has spent the majority of his career with Drummond Co. Inc. holding positions in both engineering and operations management. The Tuscaloosa native received a degree in mineral engineering from The University of Alabama in 1973 and his Master of Business Administration in 1986. He was on the development team for Drummond’s Colombian coal mining project and helped lay the groundwork for the 35 million ton per year complex, which is one of the largest mining complexes in the world. He moved up the ranks at Drummond becoming president of the mining division in 2004. In 2007, Tracy was named chief executive officer of a startup energy company called White Oak Resources LLC. He worked with a team of coal experts and amassed an underground coal reserve approaching 2 billion tons along with substantial gas and other mineral and mining rights. Tracy returned to Drummond in 2010. Since July 2016, he has served as CEO. Steven Wofford has worked on spacecraft engines for the past 31 years in a career spent working for NASA and its outside contractors. He earned his bachelor’s degree in mechanical engineering from The University of Alabama in 1986. In 1992, Wofford received his master’s degree in mechanical engineering from The University of Alabama in Huntsville. He spent the first 13 years of his career with NASA contractor organizations, Calspan Corp. and Hernandez Engineering Inc., working in support of the Space Shuttle Main Engine project. In 2000, Wofford began working for NASA at Marshall Space Flight Center. Currently, he serves as the liquid engines element manager in the Space Launch System, or SLS, program. Wofford is responsible for all aspects of liquid engine implementations for SLS, which includes design, development, test and flight of both the core stage and upper stage engines. His office recently completed engineering work and all rocket engine testing to certify the heritage RS-25 engine for flight on the SLS core stage. Wofford has received several awards including the NASA Exceptional Achievement Medal.